Two quick things today that are interesting. First, the cover for THE SCORCH TRIALS is NOT final, but it's popping up all over the Internet somehow, so I wanted to make sure I let you know about it before you heard it from another source. You can CLICK HERE to see it on Amazon, and I've seen it on a few blogs as well. There will be changes to make it even better, but that's basically it. What do you think? The word "Companion" will be replaced with "Sequel" because it's most definitely a direct sequel. Also, the colors will be more vibrant and the sky amped up a bit. Once we have a final version, I'll put it up on the blog more officially. Second, Publisher's Weekly did an article on sales numbers for 2009, and I'm ecstatic to see that THE MAZE RUNNER is included in the Top 100 (#97) for new hardcovers! Considering the competition and the fact it was only out for 3 months of the year, I'm thinking that's not too shabby! We've sold a lot through things like the Scholastic Book Fair, which don't show up on Bookscan, NY Times, etc., so this number really surprised me and made my day. Here is the article if you'd like to see it: CLICK HERE. Fascinating stuff. I'm not quite in Stephenie Meyer's league yet. Haha. I thought I'd answer some of your questions from the comments today. 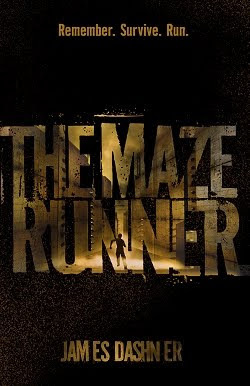 If that bores you, then go check out the UK trailer for Maze Runner, coming in August from Scholastic/Chicken House. CLICK HERE. It's basically the same as the U.S. one, but some of you may have not even seen that one. Several people asked about the next book after Maze. It's called THE SCORCH TRIALS and comes out on October 12th. There's a countdown on the right side of the blog. Hey, we're almost down to 200 days!!! Emma wondered where I got the ideas for Maze. Well, besides my crazy and slightly disturbing imagination, I always say the book was definitely inspired by two of my favorites growing up: ENDER'S GAME and LORD OF THE FLIES. Thanks for all the yays from those in cities I'm visiting on tour, and the boos from those I'm not. Both make me feel good and appreciated! I really hope to meet a lot of you. Unless you're the lady from MISERY. Rue from Dallas wants to know where you can find specifics about my upcoming tours. As soon as I have them, they'll be posted here, so stay tuned. Dave asked about New York, and I did forget to say that I'm coming there for BEA at the end of May, but I don't think I have any events outside of that. Mary at The Sweet Bookshelf wants me to come to the UK - I would love to!!!!! Who knows. I've never been to Europe, but I really want to go sometime soon. We'll see if one of the publishers there brings me out, or I guess I could arrange a couple of events if we go on vacation. We shall see! Do they like Americans? Magenta wondered who came up with the UK cover. Well, I don't really know - the design team there, I guess. But I do love it!!! Arning asked what my book is about. Well, the best thing would be for you to read the little teaser printed on the book flap, which is also available all over the Internet. Google is your friend! Graham Bradley asked when we'd be able to see the cover for SCORCH. Soon, my friend. Soon. It's really cool. LuAnn Staheli's middle school class wondered why Sato is on the cover of Book 3 of 13th. We're kind of going with a theme, a different character on the cover with each book. Tick, then Mistress Jane, and now Sato. He might be my favorite character, by the way. Jennifer Jenkins was nice enough to ask me about my knee. It's recovering nicely, except I must've done something to it because it's swollen and stiff today. I hope it's nothing serious!!! Debbie the Nerf Goddess (nice name!) brought up a good point. The US and Greek covers both use the same awesome artwork by Philip Straub, but show different angles, the Greek one showing the sky above. Why? I don't know. Different tastes. I can't decide which one I like more. Juliet Crane asked how far in the future MAZE is set. Excellent, excellent question! Well, it's never really revealed in the books, but in my mind it's over 200 years. Alyssa hoped I could post the first couple of chapters of SCORCH for everyone. Well, not yet. But I think Random House will do that within the next couple of months. Taffy asked about the last amazing movie I watched. I really loved THE GHOST WRITER, and not just because I have a mancrush on Ewan Mcgregor. Ender wanted to know how I'm liking LOST so far. Love it as always. Though I'm actually behind on the show (I know - shame, shame), so I might talk about it more once I'm caught up. I wanted to let you guys know about an online chat in which I'll be participating with a bunch of huge YA authors (figuratively speaking of course). The incredible Georgia McBride (author of the upcoming urban fantasy series PRAEFATIO in 2011) founded YALITCHAT, and the biggest one yet is coming up on April 14th and 15th. I'm honored to be included, and excited to make a fool of myself in such company! Both evening chats take place from 9:00 to 11:00 pm EST. It all takes place on twitter under the hashtag of #yalitchat. To follow along you simply search for #yalitchat on twitter then keep up! We'll be answering your questions so be sure and pipe in. If you're not following me on twitter yet, please do! CLICK HERE to do so. May everyone have a most joyous and non-sucky weekend. Talk to ya next week. Congratulations, my friend. Throw me an email address and I'll contact you. You're gonna love the book! I also wanted to announce the dates and cities for my upcoming tour for Book 3 of THE 13TH REALITY. I don't have any hard details yet, but at least you can hopefully set aside the day to come see me. Please don't make me beg. I thoroughly enjoyed watching the Oscars last night. I love Steve Martin and really wish he was my uncle. And a huge congrats to Kathryn Bigelow and everyone involved with THE HURT LOCKER. Amazing movie. Countdown to THE PACIFIC on HBO: 6 days. What do you think? I absolutely love it. Feels like a movie poster to me, which is pretty much the highest praise I can give something. Check out their website page for the book and what else they have to offer (CLICK HERE). They're incredible, and they'll also be publishing TMR in Germany. Chicken House rules!